Water pollution and contamination has reached alarming heights these days, and the lowering availability of pure drinking water exacerbates it even further. 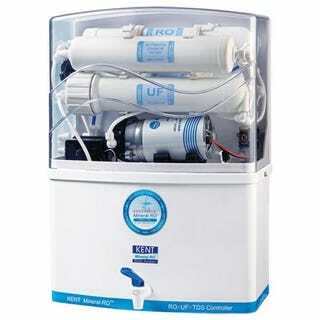 These days, the installation of water purifiers in India has become a necessity. One of the more popular models of water purifiers for home is the KENT Pride, which is an affordable and cost effective RO water purifiers available today. The KENT Pride is made of ABS Food Grade Plastic and has multiple purification membranes installed. This water purifier has a very elegant and sleek design and dimensions of 250 X 520 X 400 mm, weighing 9 kg. It occupies very less space in the kitchen and like the Grand+, the KENT Pride also has a transparent design. This transparent cover provides a lot of convenience when it comes to servicing. One of the most economical options on the water purifier price list, the numerous features of the KENT Pride more than make up for what you have to pay. The double purification technology of RO + UF prove to be very effective in removing dissolved impurities as well as chemical salts, while the TDS controller ensures maintenance of the proper levels of natural minerals that are actually required in safe drinking water. KENT Pride is fitted with the patented KENT Mineral ROTM technology that provides the double purification of RO and UF. This helps the purifier remove dissolved impurities like salts and chemicals, as well as pesticides, rust, etc. from the water; while the installed TDS controller helps in retaining the natural minerals that are essential in drinking water. With the KENT Pride water purifier, you can be assured of getting 100 % safe drinking water. KENT Pride has been tested for its quality and performance by a number of renowned labs in the world, including the WQA in USA. The Gold Seal by the WQA is one of the most important and recognized certificates of the water treatment industry. This seal provides assurance that the products accorded with this honor have been tested and have been found in compliance with the testing standards. The KENT Pride is also CE certified. The KENT Pride water purifier can purify water from a number of different sources like overhead storage tanks, bore-wells, municipal taps, and even water tankers. The ROTM technology of these water purifiers lets one adjust the TDS level of the water. The purifier does not work during power cuts, owing to the fact that it requires electricity to run. But, for these times when there is no power supply, the KENT Pride has a storage capacity of 8 liters, making for a supply of pure drinking water at all times. KENT Pride is a fully automatic water purifier. The on-off feature of the water purifier detects when the level of the purified water in the storage tank goes below maximum, and starts the purification process. When the water reaches maximum, the power is cut off. This makes for a very convenient operation without the need of manual intervention. Filter rate of 15 liters/hr. The market price of the KENT Pride is around Rs. 16500. But these water purifiers can be bought online, for discounted prices, going as low as Rs. 13553. The features offered by the KENT Pride reverse osmosis water purifier certainly outshine a number of competitor offerings, thus making it a value-for-money proposition when it comes to investing in a water purifier.